I think there was a typo... I believe it's really called, "Yosei, the Big Bad Mofo" or something along those lines. Wow, what a crazy ability! How much you want a bet that someone finds a way to bounce and recur this puppy over and over. Yeah. He's already amazingly costed, 6 for a 5/5 flyer, so he's a great deal to start with, but now add that ability, and he's a bit insane. In constructed, his cost seems a bit high, despite his ability, but if there is a way to make Yosei happen, someone will find it. Spiritmonger's cost at 6 seemed prohibitive to constructed at first, but people found a way to make that happen too. Though, Yosei is double white, making it a bit more difficult. In casual, players may take a liking to this powerful guy, though if the mainstream players like it, it may drive up the price out of many casual player's reach. We shall see. In limited, if you pull this, take it, for gosh sakes, and find a way to go White. 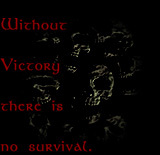 You'll likely have a pack left, so find a way. This thing will turn games. Part of a cycle of 5/5s with a leaves play ability, this explores a new area of white's portion of the color pie. Apparently, if they printed Stasis today, it'd be white. OK in constructed ... probably pretty good in a control mirror match, if this gets through. I'm sure someone will also take a recursion part to cheat on the trigger and make sure their opponent doesn't untap. So many things you can do with this, and so little time, provided you have 6 mana and it makes it into play. An OK card for constructed, screaming for a casual deck to be built around it, and a beefy 5/5 flier in limited that has a nice extra ability. my friends, is interesting card design. It’s Blinding Beam Dragon! Seriously, I do like this guy. While his ability is pretty neat, just the fact that he’s a big fat flier for six mana makes him a nice high pick for me in limited, and makes me think he has some potential in constructed as well. I also think this guy can be really fun in multi-player casual, where no one really wants to kill him because they know they will then face the wrath of his graveyard ability. * game store owner (The Game Closet - Waco,TX) Man. I guess if you want a legendary dragon that's playable, this is the way to go. I think also it's a way to soften the blow of Eternal Dragon leaving standard (type 2) play. If this guy dies, the opponent gets to tap down several cards and leave them there for a ton. This gets even more interesting with the new legend rule. There's a chance that each player could end up skipping their untap step. That is kind of neat really. Besides, this guy is a 5/5 for six mana and it's a cool looking Chinese dragon. 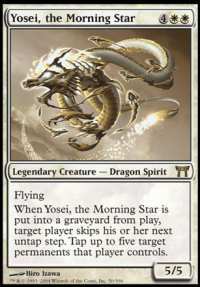 Continuing with our theme of obscenely powerful cards (see yesterday, re: Time Stop), we have a replacement creature for UW Control decks -- Yosei, The Morning Star. Sure, you get a 5/5 Flying creature for six mana. I guess that's pretty good. Oh, wait, if he goes to the graveyard, what happens? You tap all of your opponent's threats? And he doesn't untap? Why don't you play this card?!? Again, Champions of Kamigawa is showing that it has the ability to replace the goodness of Onslaught Block. Casual guys will absolutely love this card, meaning it will be incredibly hard to get ahold of any. Why? Think about it -- he's a Legend, he's a Dragon, and he comes with an insane ability. I hate to think what I'll have to do to get a playset of these. In limited -- well, Yosei is a 5/5 Flier for six mana. If you are in white, you take him, no questions asked. If you haven't chosen a color yet, you just got into white. not looking forward to people recurring this guy on me. It’s decent. If I wanted to play Stasis type cards, I’d play Stasis type cards. Plus it’s a legend (stupid new legend rule.) It is a 5/5 flier for 6, which isn’t too bad. The whole Stasis effect seems a little out of place for this card, but whatever. It’s a dragon though and like most dragons probably unplayable to do its speed. Unless Kamigawa has lots of expensive creatures, I’d stay away from this in constructed. At least it’s a spirit, so it can be obtained with Soulshift though. In casual, it’s a dragon *looks at wide eyed Timmy*.